CellNanoTox aims at the development of innovative multidisciplinary sets of tests and indicators for toxicological profiling of nanoparticles (NPs) as well as unravelling the correlation between the physicochemical characteristics of NPs and their toxic potential on various organs of the human body. For a comprehensive understanding of the complex data to be obtained on toxicology of NPs, based on in-vitro and ex-vivo studies, we have employed conventional toxicology combined with the methodologies of toxicogenomics, metabonomics, Knowledge Discovery from Data (KDD) and Data Mining (DM). This project is focused towards understanding the relation of size and surface chemistry on the deposition, uptake, translocation, and toxicity of a few selected industrially important NPs as well as novel synthesized NPs, whose size and surface chemistry will be methodically modified. Since it was shown that the penetration of NPs into the human body proceeds principally through inhalation or orally, whereas penetration through healthy skin is restricted, we have chosen lung and intestine as the primary interacting tissues/organs with NPs, while liver, kidney and the immunological system have been selected to be the secondary major sites of interaction, following the penetration of NPs into the blood circulation. The interaction of the NPs with these different target organs has been studied by making use of alternative methods to animal experimentation by employing in-vitro cell systems as well as ex-vivo studies based on precision-cut slices of lung, liver and kidney. During the project period we have performed toxicological screening of some commercial and non-commercial nanoparticles. This has been done using different cellular models of lung, intestine, liver, kidney and cells of the immunologic system. The various cellular systems showed somewhat different susceptibility towards the exposure to the nanoparticles, though the overall trend of the toxicological response was similar. Under the concentration range used, gold nanoparticles have shown almost no toxicity whereas cobalt aggregates of nanoparticles, cobalt ferrite and quantum dots were shown to be toxic. The toxicological response depended on the cellular model as well as on the duration of exposure to the nanoparticles. Longer exposure time has resulted higher toxicity than a short one. Large part of the observed toxicity could be attributed to the effect of ions which leached from the nanoparticles into the extracellular millie. One of the consequences of being exposed to nanoparticles was an oxidative stress imposed on the cells and inflammantory response of the cells the NPs. We have also found that the nanoparticles are internalizing the different cells, by different methods: (i) EM pictures of gold and cobalt ferrite NPs; (ii) Quantitive uptake into the cells of radiolabled gold and cobalt ferrite NPs; (iii) Tracking fluorescence coated cobalt ferrite NPs and Quantum dots inside the cells by confocal microscope and by flow cytometry. We have employed metabolomics technique on liver and kidney thin slices, Additionally we have studied in-depth immunological response of dendritic cells to the different NPs and Finally we have applied the KDD and data-mining methodology in the analysis of the toxicity of cobalt NPs Co-ferrite using different cellular models. The studies carried out within the CellNanoTox project address the needs of the European society for assessing the risk of occupational and general population exposure to industrially manufactured NPs. It is expected generate new knowledge on potential health risk or the absence of it, providing objective arguments for recommendations and regulations. 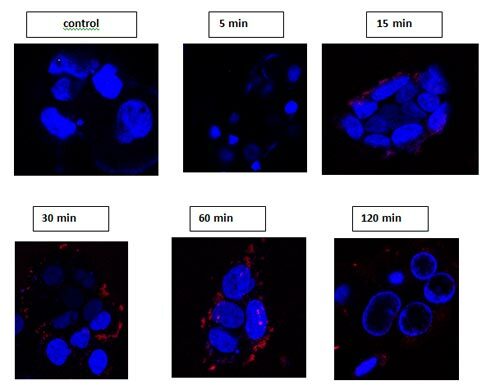 Pictures:Pictures: Confocal microscopy images of adherent Caco-2 cells incubated at 37ºC with 8 µM carboxyl-QDs at different time intervals. QDs (red)– EM: 800 (spectra was confirmed each time at the red dots), Hoechst stain (blue). Observed by confocal Zeiss LSM 510 40X, 60X objectives, live cells. Modifying toxicological screening methods for the specific NPs: MTT assay, Alamar blue assay, protein determination, neutral red assay – We have adjusted some protocols for standardisation of toxicity assays in different cellular models in order to get the most reliable and correct results. Synthesis of newly NPs: We have succeeded in the synthesis of newly interesting NPs, such as quantum dots, gold, cobalt ferrite, labelling radioactively gold and cobalt ferrite NPs. Performing quantitative uptake experiments by radioactivelables NPs - The common way to assess quantitatively the intracellular distribution of non-fluorescent NPs is by transmission electron microscopy. However, this method requires a large effort of quantitative image analysis and the employment of serial sectioning, therefore exploring the radioactive entrance of NPs in the cell can replace partially EM method. Modifying toxicological methods for standardisation of toxicity assays in thin lung and liver slices - We have adjusted some protocols (LDH release, WST assay (similar to MTT assay) in order to get the most reliable and correct results, additionally the establishment of an alternative method is important by means of reduction in animal numbers used for toxicological experimentation, precision cut slices of rat lung can be a valuable tool. Employing metabolomics in the studying of thin liver and kidney thin slices - Metabonomics is defined as “the quantitative measurement of time-related multiparametric metabolic response of living systems to pathophysiological stimuli or genetic manipulations”. Proton NMR spectroscopy is frequently used as an analytical tool, and it is currently being applied to biological fluids, mainly urine and blood plasma or serum. Its objective is to identify metabolic biomarkers specific to organ disturbances under in-vivo situations. Studying the immunological response towards the selected NPs in dendritic cells by specific immunological methods - we have assayed the activation of the immune system and characterized patterns of inflammatory molecules produced in response to exposure to NPs. The KDD and data-mining methodology was applied in the analysis of the toxicity of cobalt NPs and Co-ferrite NPs using different cellular models - Knowledge Discovery from Data (KDD) is an automatic, exploratory data analysis and modeling of data sets. KDD is the organized process of identifying valid and novel models. Data mining (DM) is the core of the KDD process, involving inferring algorithms that explore the data, develop the model and discover previously unknown patterns - by studying toxicological effects of NPs with specific data, we could provide meaningful compact models for gaining insight into the phenomena and its most important attributes. We have carried out toxicological screening of four family types of NPs consisting of cobalt NPs, gold NPs, cobalt-ferrites NPs and quantum dots, using in-vitro model systems of lung, intestine, liver, kidney and the immune system. Gold NPs, cobalt ferrite NPs, as well as corresponding radioactively labeled NPs were synthesized by the consortium. The screening was based on alveolar type II cells and lung-slices for lung, on Caco-2 cells for intestine, on MDCK and HEP-G2 cells for kidney and liver respectively and on murine primary dendritic cells for the immune system. Under the concentration range used, gold NPs and quantum dots were shown to be non-toxic whereas aggregates of cobalt-NPs and cobalt-ferrite NPs were shown to be toxic. Dose-response curves of cobalt NPs aggregates were examined employing MTT, neutral red (NR) and Alamar blue assays. Since cobalt NPs undergo dissolution in aqueous media, we determined the dose-response curves for Co-ions, employing cobalt chloride for the same endpoints. The extent of cobalt NPs dissolution was determined to enable us to examine the indirect effect of cobalt NPs on the various cell-types due to dissolution as compared to the direct effect of aggregated cobalt NPs on the different cell models. Data analysis and modelling of the obtained data sets, for the toxicological dose-response curves for cobalt NP aggregates, taking into account the dose-response curves of cobalt ions, was carried using the approach of Knowledge Discovery from Data (KDD). The first KDD goal was to discover rules for determining the toxicity of nanoparticles from the experimental results. The input data set included the consolidated experimental results, where each data record has the following attributes: (1) Cell type; (2) Particle type (Co-ions or Co-NPs); (3) Concentration; (4) Exposure time; and (5) The extent of viability decrease. The observed toxicity was modelled by a J48 decision tree classifier since such classifier model can be explained intuitively, in. Thus, concentration is the most influential parameter (highest rank), as expected from the basic principles of toxicology. The second most influential parameter (second rank) is either the compound type (Co-ions or Co-NPs) or the cell type, depending on the concentration range. The third and the lowest rank in the model is that of the duration of exposure. This model is pointing at the differential sensitivity towards toxicity of the different cell lines for cobalt ions and cobalt NPs. The hierarchy of cell sensitivity towards cobalt ions is given in the following sequence: A549 > MDCK > NCIH441 > Caco-2 > HepG2 > Dendritic cells, where A549 is the most sensitive cell line and primary dendritic cells are the least sensitive ones. However, a different hierarchy pattern emerges for Co-NPs: A549 = MDCK = NCIH441 = Caco-2 > Dendritic cells > HepG2. These hierarchies are an outcome of the dose-response curves, where the response is an average of viability determined by 2-3 different assay methods (MTT, NR and Alamar blue). It should be pointed out that when forming a sensitivity hierarchy based on EC50 data, a different pattern emerges. This difference is attributed to the different functional dependence of viability on concentration observed for the different cell lines. Therefore, the choice of the cut-off for toxicity may influence the observed hierarchy. Moreover, the modeling enables to assess the influence of exposure duration on the toxicological outcome. The comparison of the cytotoxic effects induced by Co-NPs aggregates with their respective Co-ions which leached into the medium shows higher toxicity for Co-NPs when using the Caco-2 cell model at concentrations ≤100μM both for 48h and 72 h duration. At the same concentration, A549 and NCIH441 lung cell models show higher toxicity for the Co-NPs only for the 48h exposure. The dendritic cells showed a higher toxicity for Co-NPs at 72h at concentrations 50μM < C ≤ 100μM and. In addition, at concentrations ≤ 200μM the NPs were more toxic than Co-ions for both exposure durations. The toxicological effects of Co-Fe (CoFe2O4) NPs were examined using seven different cell lines representing lung (A549 and NCIH441 cell lines), liver (HepG2 cell line), kidney (MDCK cell line), intestine (Caco-2/TC7 cell line), and immune system cells (primary mouse dendritic cells and a human B-lymphocyte cell line (TK6)). In addition, rat precision cut lung slices were examined. Dose-response curves were carried out in the concentration range of 0.05 -1.2 mM, employing MTT, neutral red and Alamar blue as viability endpoint assays following exposures of 24 and 72 h.
We have selected quantum dots as the prime NP type and gold NPs as a secondary NP type for uptake studies and intracellular recycling studies. Studies based on radioactive labeled NPs was carried out employing gold and Co-Fe NPs. Optical monitoring by confocal microscopy of NP uptake was pursuit using carboxylated, amine and pegilated QDs, based on the far red emission of the NPs, we have that Quantum Dots, especially the carboxyl-QDs and not the other two QDs have been observed internalized in all cell types examined, additionaly, preliminary inhibitors experiments have shown that the carboxyl-QDs uptake is probably through Macropinocytosis and Phagocytosis pathway but can also connected to clathrin-dependent endocytosis, experiments are being conducted these days in TAU and INSERM labs . The optical monitoring of gold NP uptake was demonstrated in dendritic cells, using reflection microscopy. The intracellular localization in membrane-bound vesicles of cobalt ferrite and gold NPs was also visualized by electron microscopy in alveolar cell types. Using radioactive labeled and unlabeled gold NPs, the uptake and the intracellular distribution of NPs in MDCK and HepG2 cells was investigated. Finally, it can be concluded that nanoparticles are taken up by different cellular systems and their internalization depends on the properties of the particles, the particle chemistry, and the length of exposure to NPs and on the different cellular systems used. Experiments on the oxidative stress induced by cobalt ferrite NPs in Caco-2 demonstrate that they possess ROS generating potential, being able to decrease glutathione level (an important anti-oxidant of the cell) and to increase intracellular ROS measured by flow cytometry using dichlorodihydrofluorescein as an optical probe. Similar studies of ROS are being conducted using the other types of cell models. The possibility of NP- induced programmed cell death was initially examined in HepG2 and MDCK cells following their exposure to cobalt ferrite however, no significant apoptotic processes could be detected. No inflammatory effects were induced in rat precision cut lung slices, HepG2 and MDCK cells (IL-8 released in the cells supernatants) in response to gold NPs and cobalt ferrite, however, it was shown that IL-8 secretion is slightly increased following incubation with cobalt ferrite NPs in Caco-2 cells and is parallel to the toxicity and the oxidative stress results. it was found that P601 and P703 do not induce any genotoxicity and morphological transformation effects. Exploring genotoxicity and genomic instability in lymphoblastic cells (TK6) and Balb/3T3 fibroblasts found no genotoxicity and/or genomic instability in the cells, also the concentrations were sub-toxic. In an attempt to elucidate mechanistic aspects underlying the interactions of NPs with organ tissues, we chose to elucidate their effects on the metabolic pathways of lactate, glutamine and glucose studied by a cellular metabolomic approach. This approach combines the incubation of precision-cut rat liver, kidney-cortex and lung slices with 13C-labelled lactate, glutamine and glucose, with the enzymatic and carbon NMR measurements of substrate removal and product formation. The results of the latter measurements have been combined with mathematical models of lactate, glutamine and glucose metabolism that have been developed and validated in-house for each tissue used. The results obtained provide a panoramic view of the metabolism of each of these substrates and of the interactions of nanoparticles with the pathways involved. Lactate, glutamine and glucose metabolism has been studied in both the liver and kidney in the absence and the presence of the nanoparticles of interest. For the lung, only glucose appeared to be metabolized at significant rates. The results provide absolute values for fluxes through the key-enzymes of lactate and glutamine metabolism in the rat liver and kidney and of glucose metabolism in the liver, the kidney and the lung. Experiments performed in the presence of carbon nanotubes (standard multiwall nanotubes of 20-50μm) indicate that for the tested concentrations there is no cytotoxicity and no activation of dendritic cells (DC). Tested QD were shown to be highly cytotoxic: they induced the death of DC, but did not activate DC since DC bearing a high amount of MHC class II molecules did not vary upon incubation in the presence of these NPs. The influence of the NPs on the capacity of DC to secrete cytokines was tested after stimulation in the presence of various inductors. It was shown that most of the NPs, when used at high concentrations, reduced the secretions of IL12, but this activity could be restored to its normal level if the strength of activation was increased. A pre incubation of human serum with the different NPs tested in the CellNanoTox programme did not induce complement activation. These results indicated that even if the NPs had no apparent effect on the viability or on the phenotype of the cells, they may perturb their functionality. A central activity of the consortium was to introduce the domain of Knowledge Discovery from Data (KDD) and Data Mining (DM) for integration and modeling of the obtained results. The KDD methodology was applied to the toxicity of Co-ions and Co-NPs in the different cellular models. The KDD goal was to discover rules for determining the toxicity of nanoparticles from the experimental results. The input data set included the consolidated experimental results, where each data record has the following attributes: (1) Cell type; (2) Particle type (Co-ions or Co-NPs); (3) Concentration; (4) Exposure time; and (5) The extent of viability decrease. Using a decision tree model, it was established that concentration is the highest rank parameter. The second rank parameter emerged to be either the compound type (Co-ions or Co-NPs) or the cell model, depending on the concentration range. The third and the lowest rank in the model was exposure duration. Furthermore, direct effects of the aggregated NPs on cells were observed in addition to their indirect effect due to the dissolution of cobalt ions from Co-NPs. Small, 2010, 6 (3), 366-370. Processing and Application of Ceramics, 3 [1-2] (2009) 103-109. Chiara Uboldi, Daniele Bonacchi, Giada Lorenzi, M. Iris Hermanns, Christine Pohl, Giovanni Baldi, Ronald E. Unger and C. James Kirkpatrick. Particle and Fibre Toxicology, 2009. 6:18. A quantitative in vitro approach to study the intracellular fate of gold nanoparticles: from synthesis to cytotoxicity. Villiers C., Freitas H., Couderc R., Villiers M.-B., Marche P.
Analysis of the toxicity of gold nano particles on the immune system: effect on dendritic cell functions. The CellNanoTox brochure is now available. As long as on stock we also send a free brochure on request.